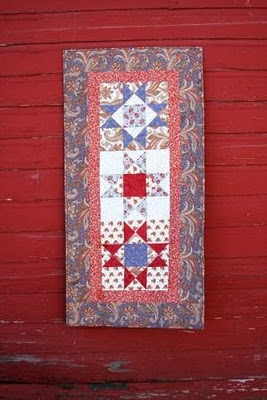 I am shamelessly stealing this photo off of Mary's blog without her permission to let you all know that "in honor of her being a guest on my blog today" she decided to give away a kit to make this beautiful table runner. Isn't it beautiful and isn't she sweet?!? I guess she forgot to mention it to me (and you) so I thought I'd pass the word along. So, go on. Click on over to Mary's blog. Leave her a sweet comment and get entered in to win. And, if you didn't see her "Tuesday Tips" post yet then keep scrolling down. And, if you didn't enter my giveaway yet, click HERE. Cute table runner! I have all of fabric in tubs too. I hate clutter but will let things get messy so I can sew not clean then I go on a rampage and straighten it all up! Cute runner! I also love the Expedit!